A person walks by a Toys ‘R’ Us store in Wayne, N.J.
Toys "R" Us is closing its last U.S. stores by Friday, the end of a chain known to generations of children and parents for its sprawling stores, brightly coloured logo and Geoffrey the giraffe mascot. But many of the children who happily sang the “I don’t wanna grow up, I’m a Toys ‘R’ Us kid” jingle grew into busy parents who found shopping online more convenient. The company, which also owned the Babies “R” Us chain, was hobbled by $5 billion in debt after a leveraged buyout that left it unable to invest and keep up. As the last of the U.S. stores close, more than 30,000 workers will be looking for work. Toys "R" Us’s troubles have also shaken some big toy makers like Mattel and Hasbro. 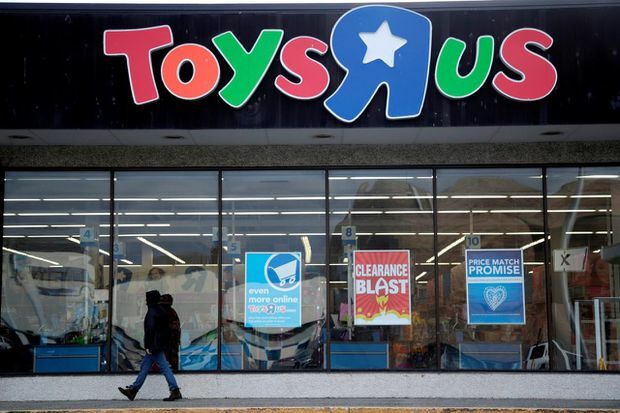 Toys "R" Us filed for Chapter 11 reorganization last fall and pledged to stay open, but had poor sales during the critical holiday season as customers and vendors shied away. In January, it announced plans to close about 180 stores, but then in March it said it would liquidate the rest of the 700-plus stores. Will the Toys "R" Us name and mascot disappear forever? An auction for the company’s name, baby shower registry and various trademarks is set for late July. The 16-foot tall statue of Geoffrey the Giraffe that greeted visitors at Toys "R" Us headquarters in Wayne, New Jersey will be moved to a children’s hospital in the state.